The time to prepare is now, Pick one or two of these items up each time you visit your local grocery store, and before you know it, your kit will be complete. Affect relatively small areas when compared with hurricanes and winter storms. Despite their small size, ALL thunderstorms are dangerous! Of the estimated 100,000 thunderstorms that occur each year in the United States, about 10 percent are classified as severe. Causes an average of about 60 fatalities and 300 injuries each year. Lightning occurs in all thunderstorms; each year lightning strikes the United States 25 million times. Lightning can occur from cloud-to-cloud, within a cloud, cloud-to-ground, or cloud-to-air. Many fires in the western United States and Alaska are started by lightning. The air near a lightning strike is heated to 50,000°F--hotter than the surface of the sun! The rapid heating and cooling of the air near the lightning channel causes a shock wave that results in thunder. Straight-line winds are responsible for most thunderstorm wind damage. A downburst can cause damage equivalent to a strong tornado and can be extremely dangerous to aviation. Strong rising currents of air within a storm, called updrafts, carry water droplets to a height where freezing occurs. Ice particles grow in size, becoming too heavy to be supported by the updraft, and fall to the ground. Causes more than $1 billion in damage to property and crops each year. Large stones fall at speeds faster than 100 mph. 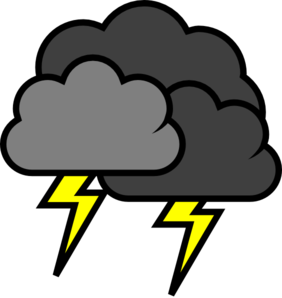 The National Weather Service considers a thunderstorm to be severe if it produces hail ¾ inch or larger, or wind speed 58 mph or more. thunderstorms or flash floods. If you are in a watch area, make plans to seek shelter if necessary. Warnings are issued when severe weather has been reported or is imminent. Sirens are meant to warn those who are outdoors. If you hear a siren, seek shelter immediately and turn on a radio or TV to hear safety information. Tornado Siren: The Town of Selma utilizes the old siren located on top of the fire station to alert citizens of any TORNADO WARNING ISSUED FOR JOHNSTON COUNTY. When citizens hear the siren, they should immediately seek cover and tune into the local forecast by radio, television, or internet for exact paths of the storm. The siren is meant to aid in notification of a warning. The best alerting system is a weather radio. The siren may not be audible for the entire town due to wind direction and weather conditions.